A three-movement work, FREE LAND begins by interweaving the essence of the landscape with the lives of original Americans. Thunderstorms, fierce wind, gentle grasses, fire, rolling hills, are entwined with the cycles of the land and of life. 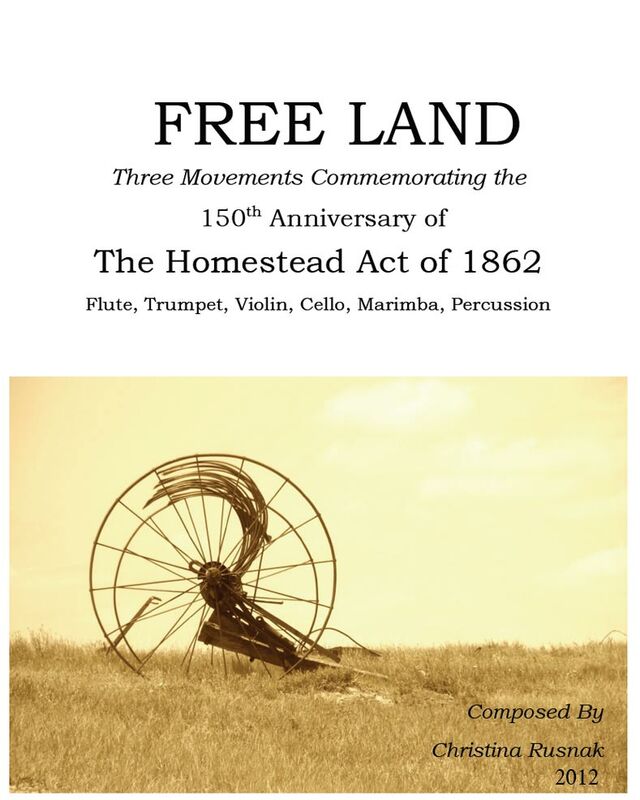 The second movement anticipates and celebrates the passing of the Homestead Act, the impact of the railroad and the clash of built up expectations with reality. The third movement dances, reflecting the revelry of the harvest coming in, while honoring the people whose lives are forever altered. The instruments brought to this new landscape included trumpet, violin, cello, and flute. Though pianos and organs were brought most often, I used marimba instead. The peak years of homesteading occurred just before WWI, and marimbas were gaining popularity during this time. The percussion seeks to evokes ancient and landscape sounds, those sounds of the early 20th century homesteader.